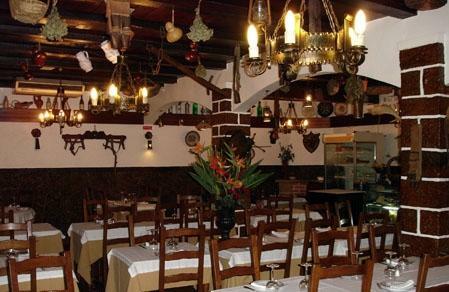 Restaurant Curral dos Caprinos is a traditional restaurant, typical of regional Portugal, located in the Sintra-Cascais region. 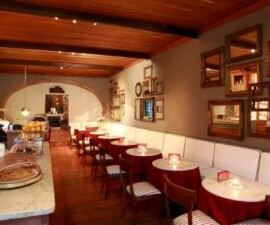 In fact, the restaurant takes its name and heritage from the old sheep and goat farm that formerly stood on its site. 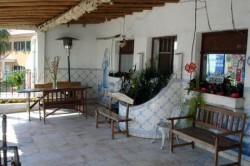 It was originally established in 1974 to complement the farm’s operation and it has specialised ever since in traditional lamb and goat recipes that are designed to please the palates not just of the domestic visitors who visit from Sintra, Lisbon, and indeed all over Portugal, but also a whole raft of international gourmands as well. 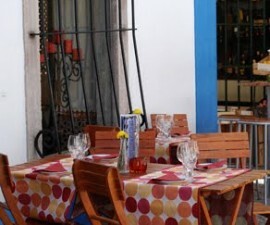 Restaurant Curral dos Caprinos is easy to find, located just ten minutes from the historic town of Sintra. Whilst it is perhaps not a destination for its views and exterior beauty, it boasts a warm, welcoming interior steeped in heavy duty carved wood furnishings, hand-painted Portuguese tiles and dark wood timbers laden with traditional sheep and goat farming memorabilia dating back over the decades and beyond. There is plenty of parking for those with hire cars, or alternatively the restaurant is just a short taxi or bus ride from the centre of town. A leisurely Sunday lunch or a cloudy day when you want to hunker down and eat comfort food in a cosy setting are the ideal times to visit. The menu is large and varied, featuring a whole wealth of lamb and goat recipes to tantalise the taste buds. The barbecued goat is a mouth-watering offering, full of flavour and literally falling off the bone and the mixed kebabs are legendary. Fish lovers will enjoy the traditional codfish balls and the baked monkfish cooked in local style. The aperitivos (antipasti) are excellent, and perfect to take the edge off your hunger if you have (rightfully) been saving yourself for a blowout meal. Cheese, prawns, hams and olives abound, all soaked in delicious olive oil that just begs to be mopped up with a large slice of locally baked bread. Portugal is legendary for its wine and the wine list at Restaurant Curral dos Caprinos features a wide selection of reds and whites to suit every taste and palate. The waiting staff is friendly and helpful, happy to make suggestions regarding both food and wine to ensure you enjoy your meal. This is a popular destination for group celebrations but don’t let that put you off – this restaurant provides a real taste of traditional Portuguese culture that makes the perfect accompaniment to your visit to Sintra.